The Cote D’azûr is not quite what I expected. I was looking for golden sand beaches but I found only pebbles the size of footballs peppered with smaller pebbles and gravel. One cannot walk on the beach without some form of footwear to protect the soles of one’s feet. Apart from that, bathing in the Med was a treat and I enjoyed bobbing about in the 26 degree warm water. The weather was glorious and altogether too hot, about 31 in the shade. Even the locals were complaining. Blue skies, cold beer, good food and lots of water. The weekend in Nice was great. We stayed at the Splendid Hotel, which it was, about 400 meters from the sea front which is known all over the world as Le Promenade D’Anglais. Once on the Promenade, one could easily believe one was in Brighton. The only difference being the huge palm trees and the traffic on the wrong side of the road for the Brits. Old Nice is a pleasure to wander about in. The streets are narrow and the buildings are high and they protect one from the sun, which was giving everyone a hard time of it while we were there. Luckily, there were numerous places to fall down in a chair and quench the inevitable thirst. And now a word of warning. I realise that one can’t take a holiday for free and that however you try to figure it, the tourist industry is only granted a certain amount of time each year in which to make it’s money, but how can a small beer possibly cost €10.00, no matter where you drink it? A small bottle of water costs €3.00 in any café. €8.00 for a coffee. Why? Overpricing seemed to be the order of the day. It was certainly so when it came to food. At least I thought so. What I paid for it, was way too high considering the quality, or lack of quality, of what I got. And that is a general observation. After eating at different restaurants for four days, one gathers a certain experience. Too little and too expensive is my own conclusion. OK, for our last evening we went to the famous Koudou restaurant on the Promenade. The food was exquisite, the wine was to die for, the service was excellent and the price was actually not bad. Certainly not hugely over expensive compared with what we otherwise paid at lesser establishments. I recommend that others going to Nice try it. Beware of the restaurants on the beach. They will charge you a tariff ranging from €14.00 to €26.00 per person just to sit in their chairs. That price goes on top of the bill. They don’t advertise the fact that they do this, so be bloody careful if you feel you want to eat close to the sea because it looks romantic. It probably is, but damned expensive too. And it could come as a nasty surprise if you eat close to the amount in your wallet. Suddenly finding out that you brought €50.00 too little is hard to explain away. Nice holds local festivals. We were lucky to be in town on one of those occasions. We knew nothing about it in advance but simply believed that all the extra activity on the Prom was due to it being Saturday night. We ate at a little restaurant from which we could see down to the beach. At 22:00, music could be heard coming from the beach area and then a 45 minute fireworks display that simply knocks the socks off anything I have ever experienced before, got under way. It was magnificent. I can’t be sure, but perhaps it was Jean Michel Jarre’s music we were hearing. It was a marvellous and totally unexpected event and I feel lucky to have seen it. All in all, we enjoyed ourselves there. I used, perhaps, a little more money than I would have liked but the whole experience of the South of France was enjoyable. I tried out my broken French, learned a little more and generally had a whale of a time. I may even go back there in the future. 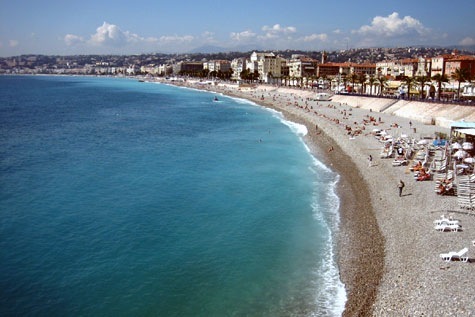 If I do, I will probably hire a car and venture off into the area around Nice rather than stay in the town itself. That will have to wait for another day and will be another story. We went shopping today. The astute and observant among you will perhaps have noticed the date on this post and say “What? On a Sunday?”. Yes. See, there are so many here in this land that have their Sabbath on other days of the week than us normal folks, that Sunday is no longer a day of rest, even for those that don’t work in shops. We went to the mall (or as I like to call it, “The maul”) and got up close and personal with those of other ethnic origin than Danish. Which actually includes me, because I’m a Brit, but I’m easy to spot in the mall on Sundays. I’m the one not wearing a burkha. Why would we go to the mall on Sunday? Well, it’s the big store birthday bargain week and the rush started today. There were things we desperately need, according to my dear lady, that were going at half price or less. Say what you like, she knows a bargain when she spots one. And there were one or two to be had. Fighting our way through the middle eastern Diaspora, we got hold of a couple of pillows, 20 huge bottles of Coke at less than half price (she drinks a lot of coke), some canvasses she can paint on, batteries, bread, a new hose for the shower and some other stuff I forgot. She was happy. I was bored, tired and annoyed at the mêlée that had continued from the moment we set foot in the store. It may be multicultural, but it has no manners at all. However, one thing good came out of all this. I have been hankering after a camcorder of sorts for quite a while but never really found one that suited my pocket. It’s not that I’m a cheapskate, but I do have my limits and weighing up possible usage against prices, I have erred on the side of not missing what I have never had. That changed today. A small and somewhat inexpensive camcorder, greatly reduced in price, that fits in my hand and appears to be capable of meeting my needs. My wife, ever the good lady she is, encouraged me to buy it. So I did. Having gotten it home, charged the battery and read the handbook, I realise the full potential of this little electronic toy. This my license not only to film my comings and goings as I gad about the world on holidays and weekends away, but to spy on my fellow humans doing unspeakable things. I will mount the thing in my car, for example. I can film all the idiots I meet on the motorway, every day, driving hazardously and dangerously right before me. You bastards are going to be the first. I will be sending the living picture evidence to the police. Weekly. Yes, neighbour, it was your dog that crapped right outside my garden gate. And yes, it was your kids that torched the dumpster up the road from my house. The possibilities are, as they say, endless. I want a Youtube account. I will also be filming myself on the toilet. I have always wondered what faces I pull when the going gets tough. I won’t be putting that on Youtube though. I can see my own back. And armpits. The back of my head. I can see over those high wooden fences now and film it for my own curiosity’s sake and all posterity. I can show the dear one what her bum really looks like, from my perspective. Oh yes. This is reality as it comes. My own Blair Witch Hunt. My own candid camera. Be afraid. Be very afraid….! Putting your life on hold for a couple of weeks isn’t really a problem if you’ve planned for it. You know, you’re going on holiday or taking a trip for one reason or another, so you know the dates of departure and arrival back home. You can notify the post office, your friends, your bank. All the people that matter. Having had to do it for all the wrong reasons, mainly my wife being ill, I now find myself playing catch up with all the things I forgot under the duress. I know I have to get my car off to the bi-annual mechanical fitness check that is mandatory here. The only problem is, that I can’t remember when I should do it or where. Strangely, I can’t find the notification that I know I received in the middle of all this trauma. I found a bill that I should have paid fourteen days ago. We had to get our drains cleaned out and I forgot the damn bill almost as soon as I was needed to ferry my wife backwards and forwards to the hospital. I have to go to my second house on the island of Lolland and sort the garden out. Also, I need to clean up and inspect the place after having had the eastern side of the house re-thatched. And get the stables whitewashed and painted. The garden here has gotten out of control too. That may be due to my being a bit worn out as I’ve been pretty much alone at work this past few weeks, while everyone else has been on holiday, and by Friday, I’m finished and spend a good deal of my weekends nursing a sore back and getting a little extra sleep. My daughter has moved into her new flat. It’s her first home away from home. A single room bed-sitter. She moved last weekend. I haven’t seen the place yet. I should do that. Maybe this weekend. There have to be a hundred other things too. I don’t know. The pressures have been a bit much lately. I feel exhausted. The good news is, that my dear wife is well again. Her voice is back, she’s back at work and all appears to be well with her. My best colleague is back from holiday on Monday next week. That will take some of the workload off me. I have a free day tomorrow, so I can get to Lolland without spoiling a weekend. All the bills are paid now, or at least, planned for. I have found a place where I can get the car seen to. I’m getting back on top of it. And best of all, we have booked a long weekend in Nice, in the south of France and I am counting down to a break in a luxury hotel, at a bargain price, close to the middle of the town and the beach.